Mahatma Gandhi rightly said, “Be the change you want to see in this world”. Each one of us has the power to make a difference, initiate a change and contribute in developing a better community. On the occasion of India’s 67th Independence Day, we dedicate this month’s India Buzz column to inspire our readers through the work done by Janaagraha, a non-profit organization which works with citizens and the government to improve the quality of life in Indian cities and towns. I’m sure Jaago Re! Jaago Re! Jaaaago Reeee! will definitely ring a lot of bells in your mind. This immensely popular campaign initiated by Tata Tea and Janaagraha was a unique initiative to motivate and enable Indian youth to vote. This is just the tip of the iceberg of all the initiatives spearheaded by Janaagraha since its inception in 2001. Today, we are talking with with Swati Ramanathan, Co-Founder of the Janaagraha Center for Citizenship & Democracy and the Chairperson of the India Urban Space Foundation. During our chat, we discuss I Paid a Bribe, an initiative to tackle corruption by harnessing the collective energy of citizens and I Change My City, a social-networking initiative that is committed to urban issues — electoral and civic. We will also explore how Janaagraha has leveraged the power of the web to sensitize and involve citizens in contributing towards the development of better communities. 1. I Paid a Bribe offers an anonymous form of reporting to common people. Kindly share with us the success that I Paid A Bribe has achieved so far. We get an average of 12,000 visits a day from across 544 cities in India, more than 20 bribe experiences reported on a daily basis from all parts of India with bribe amounts paid ranging from Rs 4 lakhs (for a seat in a medical college) to Rs 20 (to be let off for a traffic offence). A recent analysis extrapolated from data on ipaidabribe.com posted by citizens forced to pay bribes indicates that we pay over Rs. 600,000 crores each year just on petty “retail” corruption. This translates into over Rs. 25,000/- of annual bribes per citizen. This is the first time that an attempt has been made to quantify this kind of bribery. We are nationally obsessed with the “wholesale” corruption scams unfolding daily on the news channels. Retail corruption is the hidden snake injecting deadly venom in the values of our society. In addition to India, I Paid a Bribe is currently live in more than 12 countries around the world: Kenya, Ghana, Guyana, Greece, Azerbaijan, Ukraine, Pakistan, Zimbabwe and others. Within the next couple of months, I Paid a Bribe will be launched in other countries, including Hungary, Sri Lanka, Mexico, Bangladesh and South Africa. 2. On an average, how many bribe reports are filed from mobile devices? We launched apps, a mobile website in Hindi and an SMS service for reporting bribes on August 8, 2013. Within the last week, we’ve had over 200 downloads of the app since launch. Over 150 reports have come in from the apps, mobile website and SMS service. In all,15% of the traffic to I Paid a Bribe (English & Hindi) comes from mobile devices, both phones and tablets. 3. Please highlight some examples from ichangemycity where youth from the city have have been successful in proactively driving change in the community. 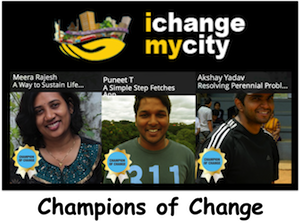 The ichangemycity.com website is a hyper-local civic participation portal for Bangalore city. In the last year since launch, it has had 500,000 visitors. The website now has an average of 60,000 visitors per month. On the neighborhood-complaint feature of the site, 5,000 civic complaints have been posted by citizens, and the government has responded by resolving 2,500 of them. There are a number of examples where the youth has taken initiative to become our ‘Champions of Change’. You can read about how Meera Rajesh was successful in educating her community about waste management, how Puneeth. 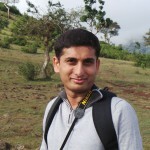 T was able to facilitate basic amenities in his neighboring schools by posting complaints on I Change My City, how Akshay Yadav and his team at Green Commandos is sensitizing residents about waste management and environment conservation and numerous examples of initiatives undertaken by children part of Bala Janaagraha. 4. 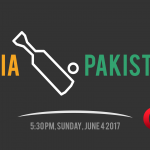 Kindly share your thoughts about the empowering nature of the internet and its implications for countries such as India. • Connecting with the government — We don’t have the links to government , either to our elected representatives or our civic agencies. • Time — We are really constrained for time. Life in the city is very demanding, with so many pulls and pressures of family, commuting and work. Civic participation makes a big demand on a person’s time, especially coordinated time, for groups of people to assemble at the same time in a common location. 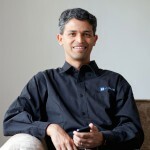 The rise of the internet, GIS, social media & mobile telephony have fundamentally altered the landscape of many sectors. The term ‘social network’ has become immensely popular recently, with platforms like Facebook and Twitter. I Change My City seeks to create a social network for social change, or a social change network. The site leverages Janaagraha’s years of grassroots work and combines the power of technology to address all three of the challenges that have limited citizens in the past: getting information, posting civic complaints and setting up community networks. 5. What message would you like to give to young people on Independence Day? Our youth is our country’s future and biggest asset. As each of you aspires to a better future for yourself, similarly aspire high for the values of our nation and the society that you live in. Start small with your own neighborhood — this is where the nuts and bolts of democracy hold the larger ideals together to build a giant vision and future. The word janaagraha means “the moral force of the people”. If you are inspired and want to make a difference, take the first step by visiting http://janaagraha.org/.